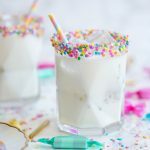 A confetti cake birthday cocktail recipe that tastes just like the real thing! Only has three ingredients and works over ice in a glass or as a martini. The best part is the festive sprinkle rim! Pour corn syrup into a shallow rimmed dish. Press 1/4″ of the rim of a cocktail glass into corn syrup and pull straight up. Use your finger or a pastry brush to smooth out corn syrup into a thin layer. Coat with sprinkles and shake off excess. Shake all ingredients over ice and strain into a martini glass or into a cocktail glass filled with ice.